Initial costs – the easiest to understand and quantify. This is the cost of equipment, installation, and controls. All of these costs are spread over the conveyor’s useful life, so a formula that might best express what your conveyor will cost is: TCO (total cost of ownership) = IC (initial cost) + OC (operational costs) + MC (maintenance costs)/ useful life of the system. Higher initial costs may be recouped in lower maintenance and operational costs over time if the right decisions are made when the equipment is specified and ordered. The initial cost savings can be eaten up by higher operating and maintenance costs, but neither of those is as expensive as a system that cannot do the job it was deployed to do. Long term costs can easily outstrip the initial costs. What are the real, long term costs and what can you do to control them? Conveyor controls – can aid you in controlling cost over time. Example: Compare two belt driven accumulation conveyors. A conventional belt-driven conveyor with a centralized drive costs less than a innovative alternative such as Hytrol’s e24 24-volt DC power roller system with its decentralized drive system. But the e24 is less expensive to install, operate, and maintain. 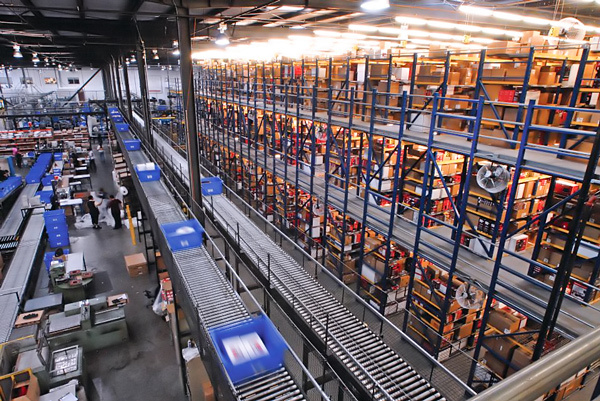 Many warehousing and distribution professionals aren’t aware of the 24 volt technology. Newer innovations have extended the life and reliability of these conveyors compared to conventional drives. You don’t have a centralized drive; you have drives throughout the conveyor, mounted outside the rollers, one motor per accumulation zone. The motor has moved from inside the tube to outside the frame. The 24-volt solution isn’t perfect for every application, of course. This must be evaluated during the specification phase. For example, a 400-foot straight line of accumulation conveyor might be better served by a conventional accumulation conveyor. A centralized drive system may cost 11-12% less over a 15-year lifespan. However, if you have a system with many curves and merges, and other integrated equipment, paying the higher initial price for a decentralized drive system can greatly reduce electrical usage and increase system versatility to offset the higher initial cost. Sleep features disconnect power from a conveyor when power isn’t needed. This can be done at a zone (case) or at a system (conveyor) level. Zone Level: you can remove power at a case level when product isn’t flowing through that particular zone. This can result in energy savings of 10-20% for belt driven live roller conveyor – and 99% on 24-volt systems. This is excellent in accumulation systems when there are times that products are accumulating and others when products are freely flowing. Conveyor Level: At the conveyor level, a sleep feature can remove products from an entire drive. For example, in a pick module application, when products aren’t being picked, the conveyor can be programmed to sleep. Not only does this save energy, it prevents needless wear and tear on the conveyor. This reduces the need for spare parts and maintenance. You can also adjust speed based on needs through controls. When you design a conveyor system, it may be built for a 5-8 year future. The conveyor may not need to operate at its maximum speed when the system is first deployed. This can also be the case for operations that have seasonal spikes – conveyors can be controlled to ramp up speed at peak times and slow it down when that level of throughput isn’t needed. This saves energy and maintenance costs. The power train is perhaps the most important aspect of any given conveyor system. Power train specification has direct bearing on every aspect of operating costs – operational, maintenance, and energy. A power train’s basic components are its motor, its gearbox, and its power transmission components. Motors are becoming more and more efficient. Motors are configured as standard efficiency, energy-efficient, and super-efficient. As you step up, each step might be only 3% efficiency. But in a larger distribution center application, simply stepping up from standard to efficient may save $10,000 to $30,000 per year (depending on functions and numbers of drives). The minimal extra initial cost often pays off over time. As energy efficiency increases, so does the life of the motor. This reduces maintenance and replacement costs over time. The gearbox is an often overlooked component, but a standard, inexpensive worm box is 50-90% efficient. A Helical Bevel gear box is 95-98% efficient. A worm box is fine when you are operating conveyor in the 10:1 ratio. If you are operating conveyors at a 60:1 or 80:1 range, efficiency levels may drop off tremendously with a worm box. Stepping up to the Helical Bevel box can move you can move from 50-90% efficiency to 95%-98% efficiency. If you can $10,000-plus a year with a simple 3% efficiency gain in your motor, imagine what an 8-10% efficiency gain can do. Gear reducers not only deliver efficiency, they reduce maintenance costs and extend motor and conveyor lifespan. Synthetic lubrication is another feature that can add a couple of percentage points in efficiency. Chain & Sprocket drives have been the most popular, default standard in the conveyor industry. They are also the costliest to operate. They are the most maintenance-intensive of the three types, and one of the most maintenance intensive components on any power conveyor with their need for lubrication. There are high efficiency, low-maintenance chains that can have a return-on-investment of about a year. You can even retrofit these chains. Timing belts are sometimes used in lieu of chain, but the efficiencies gained may not have adequate return on investment in most operations. The better option for reducing transmission costs is by using a direct drive system. This eliminates the maintenance and spare parts costs associated with power transmission equipment. Removing those mechanical components also reduces maintenance. Direct drives are more efficient, and have an ROI of 2 to 3 years. Flexibility – can your conveyor system be configured on demand to meet changing requirements? Product size changes – can your system adapt to different sized cartons or loads? When products are longer, can the conveyor system handle them? Dynamic zone allocation can adapt zero pressure accumulation conveyor to different product sizes. Product release modes (singulation, slug, cascaded): If your system needs singulation mode initially, can it switch to cascaded mode for higher throughputs at the same speed? This minimizes gaps between cartons, allowing more conveyed product in the same space. Individual zone configuration: product merging, product transferring, and workstations/pick stations. If you must bring in a software engineer to change your zones, that’s an added operating cost. If you deploy adaptable conveyor that can do this on the fly, the operating costs decline. Sortation. Can you control carton destination without extensive redesign? If the conveyor manufacturer must do this, that will no doubt be an added cost. The longer a conveyor lasts, the less it costs over time. This can be broken down into three basic factors: reliability, support, and training. Component reliability is critical. From the motor to the gearbox to the roller bearings or mounted bearings, to belting, everything matters. For instance, Abec precision roller bearings deliver the best value and longest life. Commercial bearings don’t have the reliability, and these are a low cost, high value investment. Manufacturer support: Will you receive adequate training? Will parts be available in five or ten years? Is the documentation robust and easily attainable? Can you get access to your manufacturer when you need it? What motivated you specify the conveyor type you are offering? What energy saving features are in your design? What is the mean time between failure of critical components? How frequently is maintenance required? What’s involved in reconfiguring this conveyor? What happens when my product load changes? WERC and Hytrol Conveyor have produced a video presentation that was the source for this article. See the video.